We offer special admission pricing for student groups, scout groups, and youth groups. Please contact the museum for more information about group admission pricing. The museum’s hours of operation during Open Days are between 10 a.m. and 5 p.m. Hours of operation for the June, July, and October Special Events are listed below. This Exposition will include big engines like the 40 hp Foos to all sorts of gen sets and electrical producing equipment, including the little air cooled battery chargers. Associated electrical equipment will be included. Coolspring Power Museum is hosting "History Day" from 9 a.m. to 4 p.m. There will be volunteers throughout the museum buildings and grounds to give presentations on the history of many engines in the museum along with the history of the museum itself. They will explain when and where the engines were built and what they were used for. A brief description will be given on how the engines operate and why each manufacturer made his a little different than others. Many engines will be running throughout the day, with a scheduled start-up for the larger engines. Engineers will explain how they start an engine and answer any questions you might have. History Day will give you the opportunity to have a personal tour of the museum and the freedom to do so at your own pace. Volunteers will be on hand to show you why the Coolspring Power Museum has the finest antique engine collection in the world. The gift shop will be open all day for any souvenirs or apparel you might be interested in. Restroom facilities that are wheelchair accessible are available and there are plenty of benches throughout the grounds for taking a break. A food vendor will be on-site if you wish to purchase lunch or refreshments. All parking is free. Tickets for the event are $8. Information regarding the event and tickets are available by calling the museum at 814-849-6883 or by calling Stewart McKinley at 814-316-1794 between 8 a.m. and 9 p.m. Eastern Time. Your ticket includes presentations and tours. History Day events are 9 a.m. to 4 p.m. This is a show for fun! No judging of cars, trucks or tractors. No vehicle is too large or too small. We will also be having History Day with the show and many engines will be running along with tours of the museum. A food vendor will be on-site if you wish to purchase lunch or refreshments. A donation to CPM for showing your vehicle is appreciated. Admission for showing your vehicle is free if you are a museum member. Questions? Please call Stewart McKinley at 814-316-1794 between 8 a.m. and 9 p.m. Eastern Time. The museum fields are open 9 a.m. to 5 p.m.
Events at Coolspring Power Museum are scheduled to coincide with the third Saturday of the month from April through October. Our April, May, July, August, and September Open Days are on the weekend of the third Saturday of the month. The museum is open on Saturday and Sunday of this weekend. and include the preceding Thursday and Friday. The museum is open Thursday, Friday, and Saturday for the Exposition. The museum is closed on Sunday of this weekend. Each year our June Exposition features a particular engine. Here are the featured engines for five years of Expositions. June 14, 15, and 16, 2018 - Oil Field Engines and Related Machinery: This Exposition will include big engines, small engines, vertical engines, pump jacks, pumps, compressors, and all sorts of related oil field equipment and gadgets. June 13, 14, and 15, 2019 - Electric Lighting Engines and Gen Sets: This Exposition will include big engines like the 40 hp Foos to all sorts of gen sets and electrical producing equipment, including the little air cooled battery chargers. Associated electrical equipment will be included. June 18, 19, and 20, 2020 - Miller 2020: Twenty years after Miller 2000 and the dedication of the 300 hp Miller, this Exposition will include the dedication and running of the 150 hp Miller. All engines built in Springfield, Ohio, will be included. June 17, 18, and 19, 2021 - Stover and Related Equipment: Dan Stover was an early builder of quality farm engines. Any Stover engine is included in this Exposition. Equipment they operated will be welcome. June 16, 17, and 18, 2022 - Fractional Horsepower Engines: There are many out there such as the New Holland. This Exposition will include Maytag, Briggs and Stratton, and all small engines. Model engines will be included. 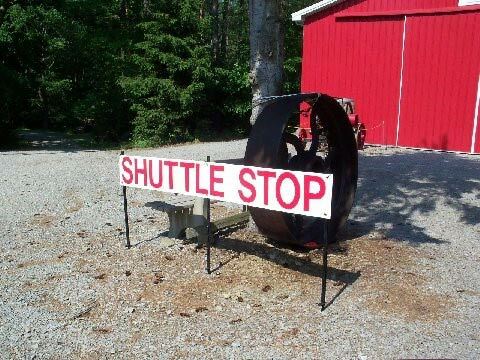 Coolspring Power Museum offers a shuttle transportation service for our visitors. The shuttle operates Thursday through Saturday during the Exposition & Flea Market in June and Thursday through Saturday during the Fall Exposition & Swap Meet in October. Hours of shuttle service are 9 a.m. to 5 p.m. Shuttle stops are at the Museum Gifts and Souvenirs Shop and at the Friends Exhibition Hall on the hilltop. We request a $1 donation per ride to support the cost of operating the shuttle. · Alcoholic beverages are prohibited on museum grounds. · Proof of liability insurance is required for all motorized personal transportation vehicles such as (but not limited to) golf cars, utility vehicles such as gators or mules, riding lawn mowers, unregistered motor vehicles, ATVs, motorcycles, etc. Motorized vehicles, such as Rascals, Hoverounds, mobility scooters, and motorized wheelchairs, needed by their operators for personal mobility are exempt from this insurance requirement. The Coolspring Power Museum reserves the right to limit or restrict the use of any and all vehicles used to transport people on the museum grounds on a case-by-case basis. · NEW ARRIVALS of exhibitors and vendors for the June and October events may access museum grounds for set-up beginning Tuesday from noon to 8 p.m. and on Wednesday through Saturday between 7 a.m. and 8 p.m. the week of the event. Please plan to arrive during these daylight hours when the museum volunteer staff is on hand to assist you. After you set up on the museum grounds and receive a vehicle pass, you may come and go as you please at any hour. Walking access to the museum grounds is unrestricted at any hour. · AFTER HOURS, Security Personnel will direct you to temporary overnight parking only 200 yards north of the museum entrance across the street from The Old Store Antiques on the main street. It is clearly marked for your convenience. · Additionally, motor homes and campers that don’t belong to volunteers, Expo participants, or Flea Market sellers may not camp on museum grounds. Space is provided at the same location as the overnight parking across from the antiques store on the main street. No hookups are available on museum grounds or at the overnight parking area - primitive camping only. · These rules apply to all Coolspring Power Museum Support Group Members, Friends and volunteers as well. · The speed limit on the CPM grounds is 5 mph. Vehicles in showground areas are limited to 2 mph, a safe walking speed, as pedestrians may not be aware of your presence. · Care must be taken when loading and unloading engines and equipment. Use chains, cables, winches, and approved lifting straps. · For running displays and equipment demonstrations, safety ropes, guards, and barriers should be in place to keep separation between the public and moving or operating equipment. · Displays of engines and equipment should never be left running unattended. Someone familiar with the engines or equipment should always be in the immediate vicinity. · All engines should be in good general condition before being operated on CPM grounds and inspected for loose flywheels, brackets, fuel lines, fuel tanks, etc. Exhausts should be muffled and/or aimed away from spectators. · Engines should be stopped for refueling. Store fuels in labeled and capped containers. It is also recommended to have a fire extinguisher close by in case of fire. · The museum reserves the right to shut down any equipment that is either left unattended or operated in an unsafe manner. · Personal protective equipment should be worn around any displays that create dust, sparks, flying debris, or noise. Use of safety glasses, gloves, and hearing protection is recommended. Exhibitors should be careful to keep loose clothing from being entangled in operating engines or displays. · All pets should be kept on a leash with the owner in attendance. Owners will clean up after pets. permission of Coolspring Power Museum.